Thermal and Catalytic Oxidizer Systems and Scrubbers remove VOC and particulate generated from specialized coating processes used on metal packaging. 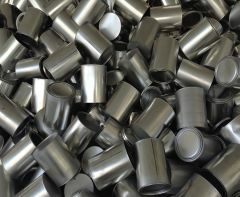 The Metal Packaging industry uses specialized processes to apply coatings to packaging, most commonly cans and boxes. Paints, coatings, solvents and laminates release vapor with varying levels of Volatile Organic Compounds (VOCs) and particulate when they are applied and as they are dried or cured. Pollution Systems offers a full line of Thermal Oxidizers and Wet Scrubbers that can eliminate this waste from the exhaust vapor. Thermal Oxidizers use combustion to remove the pollutants from the exhaust stream, and can achieve destruction rates in excess of 99%. Recuperative Thermal Oxidizers are most effective for exhaust streams with high VOC and particulate concentrations, such as those containing solvents and specialty coatings. Regenerative Thermal Oxidizers are used for vapor with lower VOC and particulate concentrations and exhibit high energy efficiency. Catalytic Oxidizers are used with low, stable VOC concentrations, and are used for coating processes that do not release high levels of pollutants into the exhaust stream. Particulate/Venturi Scrubbers are most effective for residue with high levels of condensibles as a result of the drying process. Particulate Scrubbers remove the particles by capturing them in liquid, causing them to drop out of the exhaust stream. With capture efficiency rates over 99%, these scrubbers produce clean exhaust for release into the atmosphere. Pollution Systems’ custom designs can provide you with a Thermal Oxidizer or Particulate/Venturi Scrubber designed and manufactured to meet the requirements of your Metal Packaging application. Our experienced design staff will work closely with you to design an energy-efficient, reliable and long-lasting emissions control system. Buying equipment from Pollution Systems is only the beginning, not the end. We design and build the systems and provide service support throughout the life of the equipment. We also offer short, medium, and long-term Rentals of our Thermal Oxidizers and Wet Scrubbers for industrial processing during the installation of new equipment, for extra waste processing during remediation, or for running pilot studies prior to purchase.